With stories on Fairtrade Fortnight across the county, the April 2012 edition of the “Fair Enough” newsletter for Fairtrade Schools in West Yorkshire is now available: Fair Enough – April 2012 (PDF). Based in North Yorkshire, From The Source import and sell fair trade and ethical fashion and accessories online and at special markets, events and festivals. In an age of fast fashion, throwaway products and faceless high street shops, from the Source aim to connect their customers with the people that make the products they sell, and promote trade that can help make the world a better place. 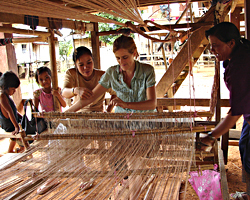 Fiona of From The Source having a go at weaving whilst visiting fair trade producers in rural Laos. From The Source was set up in 2007 when, whilst living and working in Laos, Paul and Fiona were inspired by the rich heritage of traditional crafts, particularly textile production. They made some great contacts, returned to the UK, and started to import textiles and crafts from Laos, providing an opportunity for a range of producers to get their products into international markets, and export to the UK, for the first time. From the Source specialise in high quality, handwoven, natural textiles – silk and organic cotton scarves and handwoven cotton clothing – gorgeous handmade fabrics that are a joy to wear and admire. From the Source actively support organic cotton farming, the use of natural, botanical dyes, and work directly with organisations that provide training, resources and a sustainable livelihood for the people in some of the poorest countries in the world.